As I’m pressing my fingers to the keys I am almost filled with an uncertainty of sharing this. I can feel the light thumping of my heart. I guess that’s what happens when you know you are about to spill your truth. The truth that once it’s written and said out loud cannot be taken back. This writing I pray consists of true vulnerability and shows what an ultimate healing love can come out of tear-filled conflict. There are many special people I will be mentioning in this and I pray that they will feel I have written as respectfully and gracefully about these situations that were incredibly real and painful. I think what has made my grief journey so hard is the massive amount of conflict that lives in every path I take. A reminder of how things could have been. If I had not lost my first son Brenden, my life would be completely different in EVERY single aspect. The life that I have now would not exist whatsoever. Yet my life right now is exactly everything I ever wanted, I literally could not be happier (other than Brenden being here). But that’s what I’m saying—MY LIFE, THE RIGHT NOW THAT I LIVE IN WOULD NEVER HAVE HAPPENED IF BRENDEN LIVED. The Ultimate Conflict. Bill, my now fiancé, and I were very new and fresh when I found out we were pregnant. We barely knew each other. It was not the MOST ideal situation. Did I mention Bill is quite a bit older than I? Did he really want this? What would life be like to parent with someone you were still learning to love? Bill has a HUGE heart, I love him for that. We knew whatever our choices, we needed to be responsible and parent and love this surprise baby, and that’s exactly what we did. In every single possible way. And then at nine months pregnant, Brenden died. He was gone. His heart stopped with no explanation. From that moment, Bill and I never looked at each other the same way. Bill watched as our dead baby was pulled from my convulsing body after being told I could pass away, too, if I wasn’t brought down immediately for an emergency C-Section after 36 wrenching hours of labor. Dead kids make you or break you. There are so many layers, and yet it’s really as simple as that. We held on. Hard and tight until we started to be able to breathe again—together. We found out baby number two was on his way six months later. Talk about an entire different mindset going into this one. We were ready to be a family…again. But now in the best possible way. But in that, can I say I’ve soon realized and seen first-hand with baby number two (William) that parenting isn’t nearly as easy as we think? The long nights, the frustrations of no sleep, and sometimes feeling overwhelmed with baby life is very real. Sometimes, being a mom drains everything from you—leaving just a pile of mush. And because you are tired, and hungry, and of course now super cranky, and feeling like a human cow—you don’t think your partner cares at all. Those feelings can crush a relationship. 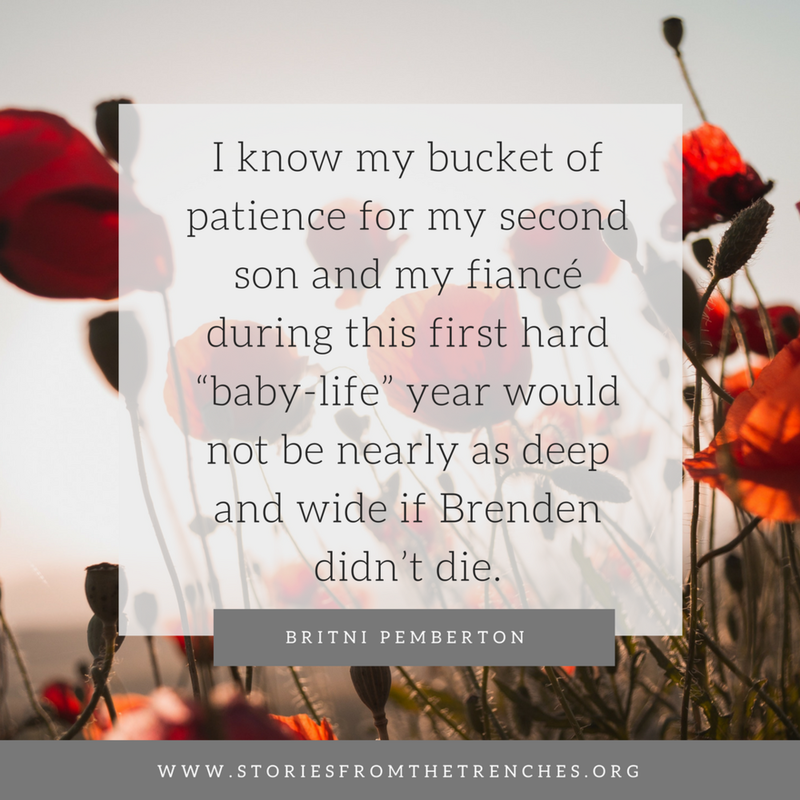 I know my bucket of patience for my second son and my fiancé during this first hard “baby-life” year would not be nearly as deep and wide if Brenden didn’t die. That makes me feel like an awful person, but I know my truth. I would have been a good mom and Bill would have been good dad, but losing Brenden made us a much better set of parents to William as well as to each other. Bill and I now share a hurt and a love so deep that nothing outside of that matters. Small things can seem like big things, but I say often—our kid died, this is nothing. We got this. When it all boils down to it, we feel like we can get through it because we lost Brenden, and so far to this day we have survived holding onto each other. Again, a love that blossomed and would have never taken such deep roots without our loss. This one is a tough one. I love my parents. Actually, I love my parents right now more than I have ever loved them in my life. 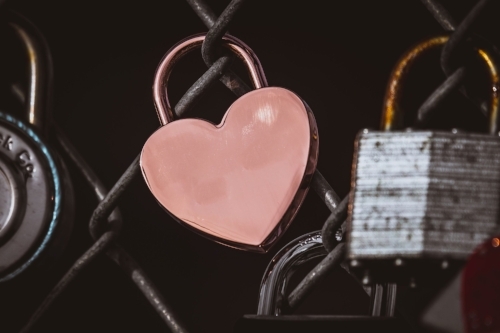 When I first told my parents that their very-unmarried daughter was having a baby with the family’s older mechanic, you can imagine that didn’t go over so well. In fact, it was so bad that my dad didn’t talk to me for nine months. Yes, do the math. The first time I saw or talked to my dad was in my driveway two days after I came home empty-handed from the hospital after delivering Brenden. I hate to say it out loud, but I do feel out of all the kids in my family I am the closest with my dad. We have a special bond. Instead of my dad being excited with the announcement of our bun in the oven, he was broken. He feared for me and didn’t want me to experience the things that can happen when you have kids and aren’t married. He didn’t know what to do or say, and so in Pemberton fashion he stayed quiet. Losing Brenden broke my father. He hasn’t been the same since. My father is still not pleased with alot of my lifestyle choices. I know I don't make him a "proud dad" by staying unmarried. I hope he sees my heart and the love that my family has grown. All in hopes that he doesn't let his baptist, legalistic, judgmental childhood upbringing get the best of him. Thankful my parents showed up in every way I could have asked after Brenden. My mom stayed with me for months at our home in Arizona (across the country from her home), to make sure I woke up every day and at least tried to set my feet on the ground. She made food, she cleaned our home—she knew I needed that help but didn’t know how to ask. She prayed with me and over me every single day. We read books together on grief and loss, and had many long talks on the way to the doctor every other day to deal with the repercussions of my C-section not healing properly. When she was able to take over for the doctor, after being taught how to care for my open wound, she took over with gentle hands and a broken heart. Every day for three months, my mother flushed my open wound and stuffed me with gauze, knowing it was just a constant reminder of my boy that wasn’t at home with us to break up the overwhelming silence. When we told my parents we were pregnant for the second time, it was completely different. Of course their long-term hope is that Bill and I get married, but they did not let that affect their complete joy for another baby. A chance to do things right. They have been great grandparents—William has been showered with love, enough love for two babies. My dad called weekly (if not daily) to check on me throughout my pregnancy with William, checking up after every appointment. He wasn’t going miss a thing this time. Brenden taught us all what was important—to love above all things. The hurt of choices and renewed relationships I have with my family would not have been possible if Brenden lived. I had a great job when we found out about baby number one. I worked hard and taught myself an insane amount about an industry I knew nothing about going in. Although it required a lot of hours and stress came easily in the position I was in, I am forever grateful for that job. I learned a lot and had great bosses. I remember calling my boss on the way to the hospital to let her know Brenden died, and I would not be returning to work. That was hard. I had no idea what life was going to look like now, I just knew he was gone and I didn’t want tomorrow to ever happen. A few months after being at home, I was asked if I would be interested in working again by a dear friend I previously worked under, who had also visited Bill and me with her husband at the hospital during our four-day stay. She checked on me weekly. Those friends are few and rare, hold them close. Her offer was an opportunity to work from home, doing a job I was already familiar doing, working under her. SCORE! Complete Godsend. She has been amazing. She hired a girl who struggled with leaving her house and talking to people. In her own way, she got me out of my shell without having to think about getting in a car and trying to act normal in front of an entire office for forty hours a week. And being that “crying at random times” lady with a dead kid—I couldn’t do that. I was too broken. There were many times I had to retreat to my room for fifteen minutes or more to cry and gather myself; there was no way I would have done that kind of crying in the office bathroom. I also have great insurance, so that was nothing to stress about with baby number two, either. If Brenden was here, I was be waking my boy up too early every day, to stick him in my car to drive to a daycare that costs as much as a house payment. I know not everyone has that option to stay at home, but that was my dream. To be at home raising healthy children, having a say in how they develop. I get to raise William and be with him all the time, even throughout my busy work schedule. I make homemade organic baby food, I love being in the kitchen so Bill gets at least two homemade meals a day, plus I’m a clean freak. That’s not possible being away from home all week. Because of Brenden’s absence, William has the childhood I wanted to give to Brenden and wouldn’t have been able to. Brenden was going to be our one and only. If we didn’t lose Brenden, we wouldn’t have William. God must have something so ridiculous planned for his life, I just can’t wait. I lost weight after Brenden, which made it easier to get pregnant again. I was healthier than I had been in a long time. I was taking care of my body and my mind with proper nutrition and exercise. My doctor visits were amazing, I had a new set of doctors and nurses who cared deeply for our family and helping William arrive safely. The surgery went better than textbook. My second C-section healed a thousand times better than my first, literally a completely opposite experience. We were able to bring this sweet little brother home, allowing our hearts to heal a little at a time. My entire friend-base changed. Either friendships got stronger, or they disappeared. Not all friends know how to handle grief. I pray there is understanding and forgiveness on both sides. A blessing in disguise—I met tons of new moms that also lost children and could meet me where I was in my journey. Soulful, loving, brave women I would have never met…if Brenden lived.